Add quality comfort and modern style to your home with this contemporary sofa. 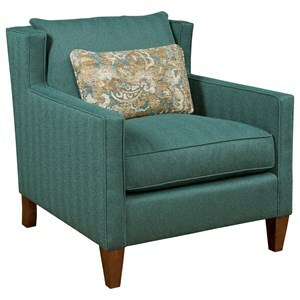 The thin track arms feature a slight wingback design, which adds to the stately presence of the sofa. Its two cushion design continues to update the look of this piece, ensuring a perfect fit in your living room. The 317 Contemporary Sofa with Thin Track Arms by Kincaid Furniture at Hudson's Furniture in the Tampa, St Petersburg, Orlando, Ormond Beach & Sarasota Florida area. Product availability may vary. Contact us for the most current availability on this product. Browse other items in the 317 collection from Hudson's Furniture in the Tampa, St Petersburg, Orlando, Ormond Beach & Sarasota Florida area.